If you're struggling to choose a position that's right for you, a free career aptitude test may be able to give you the insight you need to find the job of your dreams. While some people appear to be born knowing what they want to do with their professional lives, others are not so lucky. Even if they have several different interests, skills, and passions, they're simply not sure how to find a career that excites them. Luckily, career aptitude tests were created to help with this problem. 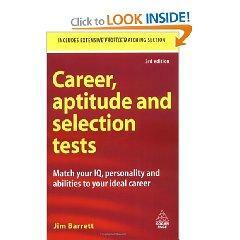 A career aptitude test is generally a modified version of a personality test. By asking a series of questions about how you see yourself, the activities you enjoy, and your personal preferences, the test can provide a list of careers that have shown to be a good match for individuals with similar characteristics. When it comes to finding career aptitude tests, current students have a definite edge. High school and college guidance counselors have access to a number of resources for those seeking career information, including several different aptitude tests. Discover Your Perfect Career: Monster.com has a very short quiz to help you identify your personality type, as well as a list of suggestions for careers that match each possible trait. You can also visit the Personality Page for a more exhaustive list after you've completed the Monster quiz. Human Metrics: This site provides a more extensive version of the Monster quiz, designed to help you identify your Myers-Briggs personality type and potential career matches. Keirsey Temperament Sorter: This test is based on the theory that all people can be grouped into four basic personality types: Artisans, Guardians, Idealists, or Rationals. This is a highly respected career aptitude test that is often used by Fortune 500 companies, counseling professionals, and major universities to provide career placement assistance. Career Key: This test, based on Holland's Theory of Career Choice, tells you if you are Realistic, Investigative, Artistic, Social, Enterprising, or Conventional before offering a short list of potential career suggestions. Similar Minds: After completing a series of questions, you'll see how you rank on various personality traits and be given a list of careers which may be a good fit for your needs. If you wish, you can then copy the HTML code needed to put your results onto your own personal Web page. Six Wise: Working adults will find this test particularly useful, since it asks practical questions about how you view the workplace and your current profession before providing a list of potential new careers to consider. Princeton Review Career Quiz: This quiz offers a unique insight into your personality by asking which jobs you think you would prefer assuming all were of equal pay and prestige. While free career aptitude tests can be interesting and informative, it's important not to take the results too seriously. The list of careers generated by the test is merely a suggestion based on what researchers know about the work environment in a particular profession. If your test suggests a career as a musician may be a good fit, for example, remember that the developer of the test has no way of actually assessing your musical skills. This recommendation is simply based on the external qualities of a career in the music industry. Once you've compiled the results from your career aptitude test, consider choosing two or three new possibilities to research. As you learn more about the occupations suggested by your test results, you'll be better able to decide which avenues are worth pursing further.